Juliet is just eighteen years old when she is recruited by MI5 (the United Kingdom’s Security Service) to transcribe the meetings of British citizens who are sympathetic to the Nazi cause. It’s no small feat – the work is tedious, terrifying, and requires Juliet to shift between various names and personae to protect her identity. She becomes a master of deception, and, in so doing, becomes acutely aware of just how many webs of lies are being spun around her. One thing Juliet knows for certain is this: no one is who or what they seem. Ten years later, Juliet is a producer at the BBC, a far cry from her days as a recruited spy. Her job now is to create programming about the past for children – versions of history that are informed more by nostalgic ideals than concrete fact. The irony isn’t lost on her – as a spy her job was to uncover the truth – at the BBC, her job is to mask it. Juliet fears that her life has run its course, that she is fated to become a lonely spinster. But this fear is quickly eradicated when she is confronted by figures from her past, and realises that you never truly escape the MI5. Although a different war is now being fought on a different battleground, Juliet again finds herself under threat. It is not long before she realises that there are consequences for every action, and truth behind every lie. Kate Atkinson is an award-winning, best-selling English author whose work continues to astound and amaze readers across the world. Transcription is no exception – a work of remarkable depth and texture, this book takes you on a journey through time, asking important questions about the lies we tell ourselves and others, and the ever-shifting nature of identity. Juliet’s character draws you in from the very beginning – observant, intelligent, sharp and witty, she is an engaging companion, carrying you through the story with a strength and world-weariness that only a truly great writer could inject into her characters. Kate has a remarkable talent for playing fast and loosely with time – with great structural inventiveness, she shifts between time and place, carrying the reader through various portals and pockets of history. The greatest pleasure of this novel is undoubtedly the language – Kate’s writing is injected with a cunning humour that is seldom found in historical fiction. This, accompanied by her empathetic and intelligent character descriptions and dialogue, make for a truly compelling read. The book is an interesting fusion of spy thriller and historical fiction (though it was still meticulously researched for historical accuracy). As such there are twists and turns, surprises and intrigue. If you enjoy novels that delve into the unknown and give you a fresh perspective on history and the human condition, then we highly recommend this triumphant gem. 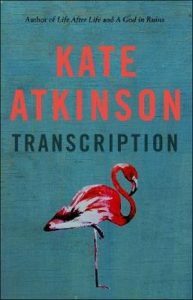 Kate Atkinson won the Costa (formerly the Whitbread) Book of the Year prize with her first novel, Behind the Scenes at the Museum. 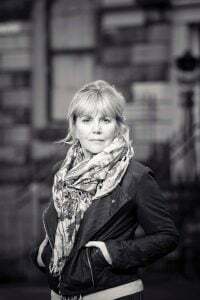 Her bestselling novels include the four featuring former detective Jackson Brodie which became the BBC television series Case Histories, starring Jason Isaacs. Her 2013 novel Life After Life spent a record number of weeks on top of the bestsellers lists on both sides of the Atlantic, and won the South Bank Sky Arts Literature Prize and the Costa Novel Award, a prize Kate Atkinson won again in 2015 for A God in Ruins. Her new novel is Transcription.